Excerpted from The China Mission: George Marshall’s Unfinished War, 1945-1947, by Daniel Kurtz-Phelan. Copyright © 2018 by the author and reprinted with permission of W.W. Norton & Company. Join ChinaFile, Daniel Kurtz-Phelan, and ChinaFile Publisher Orville Schell for the launch of Kurtz-Phelan’s The China Mission: George Marshall’s Unfinished War, 1945-1947, on April 11, 2018 at the Asia Society in New York. Details and tickets are available here. Soon, such a scene would become unthinkable. It was a cold morning in early March 1946, a rocky airstrip laid along a broad, barren valley in China’s northwest, lined by mountains of tawny dust blown from the Gobi Desert. Six months earlier, one war, a world war, had ended. Six months later, a new war, a cold war, would be under way. Yet here stood General George C. Marshall and Chairman Mao Zedong, two of the great antagonists in the war to come, in intent conversation. Each wore the uniform of his army: the crisp khaki of a fivestar general, the plain tunic of a revolutionary. On this morning, they spoke of friendship and peace. Marshall’s arrival in Yan’an was to have signaled that the Communists’ time in the wilderness was over. When the plane landed, its pilot spotting the 1,000-year-old pagoda that marked a hill above town, a large crowd was waiting, 6,000 people by the count of Yan’an’s Emancipation Daily, summoned by Mao. The aircraft was itself a symbol of American might, a C-54 Skymaster sent under Lend-Lease to Winston Churchill and outfitted in the wood and leather of an aristocrat’s club before being returned to the United States for use by one of its great heroes. 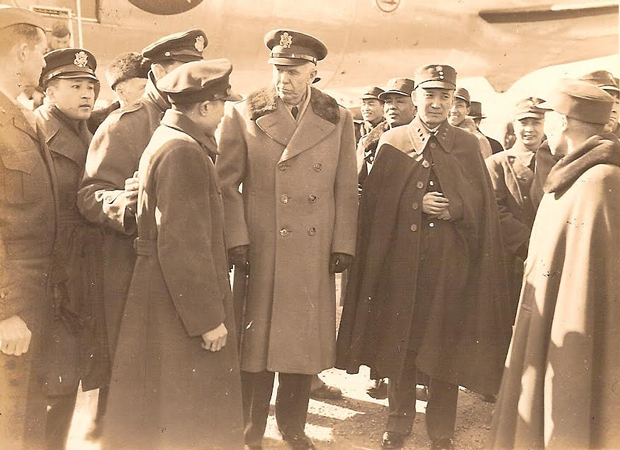 General Marshall in Nanjing, 1946. Over the course of that evening, Marshall had conferred with the top leaders of the Communist Party—Mao, the diplomat Zhou Enlai, the military chief Zhu De—about China’s future as a democratic great power. (Mao “sits and masks his face completely,” an aide wrote in his diary, but “Marshall told him frankly what was expected.”) He had toasted their common future at a banquet. (“All were satisfied,” the official press reported.) He had sat for two hours in a freezing auditorium and watched a Communist troupe perform songs about revolutionary heroics, beneath a proscenium hung with images of Lenin and Stalin that he did not fail to notice. He had toured the ruined town center in a jeep, a model of vehicle he had ordered built and shipped around the world a few years before. (Mao would ride in a sun-bleached van that had printed on the side, “Presented to the heroic defenders of China by the Chinese Hand Laundry, East 42nd street New York NY.”) He had spent the night in an eight-room out-post of American soldiers and spies—the Dixie Mission, America’s station behind rebel lines. Despite an aversion to triumphalism, Marshall could not help but feel that this was something of a victory tour. He had been in China for two and a half months. By all appearances, he had done the impossible again. In World War II, he built the American military machine and led it to victory—“armies he called into being by his own genius,” as Churchill put it. Then, when the war was over, Marshall was tapped for a last mission. President Truman needed him in China. It would be a short mission, a few months. This time, rather than win a war, his charge was to save the peace. That same day, March 5, 1946, 7,000 miles away, Marshall’s admirer Winston Churchill was also speaking of the future. His was a darker prophecy. In Fulton, Missouri, with Truman on the stage beside him, Churchill warned of an “iron curtain” falling between the West and the Communist world. And he was not the only one sounding such a warning. Senior American officials were decrying Stalin’s treachery. The American army was announcing a ban on Communists in the officer corps. American newspapers were reporting on the theft of atomic secrets by Soviet spies. There were dark currents everywhere. On the airstrip that morning, Marshall could see the way to a different future. There would be no Chinese civil war and no Communist China. Autocrats would become democrats. An enduring alliance between the United States and China would serve as a pillar of stability in Asia. China would help keep order and calm across the globe, Chiang and Mao a bridge between the Americans and Soviets. Marshall, the revered general, a man of war for almost 50 years, would end his career and go off into retirement with a valiant stroke for peace. But history would flow from Churchill’s words that day, not Marshall’s. Over the next 10 months of his “short” mission, Marshall’s achievements would collapse. The agreements he brokered would fracture. Civil war would come after all. There would be talk of World War III, of American boys fighting Soviet boys on Chinese battlefields. A few years later, Mao and the Communists would conquer China. Soon enough, American boys would fight Chinese boys on Korean battlefields. Millions of Chinese would perish in the throes of revolution. Once Marshall’s plane took off over the mountains that morning, Mao would not meet another high-level American representative until Richard Nixon’s visit 26 years later. In the United States, the question would be put crisply: Who lost China? In the angry debate, many Americans would give Marshall and his mission a bitter share of the blame. Ultimately, he would be remembered for leading the Allies to victory in World War II, for forging a new model of global leadership as secretary of state, for the effort—the Marshall Plan—that saved Europe and became shorthand for American power at its best. But others would remember him for this mission—some as the man who lost China, some as the man who kept his country from a more catastrophic fate there. The scene that morning on the airstrip would become the high-water mark of hope—not just for China, but for a different kind of world, for a new order of peace after the worst war ever known. “The next war,” Marshall had said in the final hours of the last one, “might destroy the world. It must not come.” When hope broke apart, the scene that morning would also become the image of failure, of weakness, of betrayal. Not long before, it would have seemed unthinkable that George Marshall could have gotten this far, face-to-face with these men, on this airstrip, on this mission. Not long after, it would seem unthinkable that he ever could have come here at all.